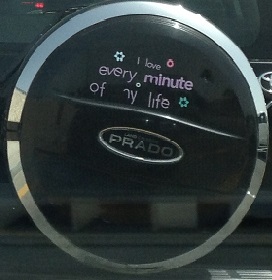 Today, at the stop light, I drove up behind this car. Instantly, I noticed the positive affirmation. From my point of view, it was a Divine sign. I love believing that all around us are Divine signs. The trick is to notice them. It is not that I rely on interpreting a bird’s flight or analyzing coffee grounds to make a decision. If I have a major decision or a problem, I spend time researching the issue and weighing the consequences. Then I let it go and wait to see how my heart feels with the direction I am taking. Some may say it is foolish to believe in signs. In my experience, most Divine intervention have nothing to do with finding a new job or love, deciding whether to move or stay put, or mapping out our future. The signs I see remind me to notice beauty, to enjoy the moment or to be grateful. In other words, be present. Thank you, unknown woman, for putting out this positive affirmation. I also believe there are messages in all things around us.. everything is energy and presents to us and opportunity to awaken! Thank you for sharing that Cinda. Hopefully we awaken to discover more love and beauty all around us.